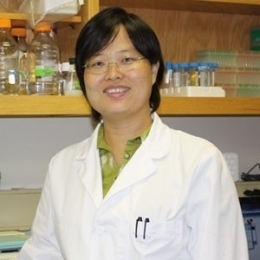 Beilei Ge - Beilei Ge, Ph.D.
Dr. Ge is one of the first researchers funded by CPS. She has an interest in food microbiology, specifically, the bacterial population. "Dr. Ge has outstanding research ability and creativities," noted Dr. Jianghong Meng, Interim Director of the Joint Institute for Food Safety and Applied Nutrition at the University of Maryland. "She is very good at using her knowledge and skills to identify emerging problems related to food safety." CPS student staffer Alyson Barnes spoke to Dr. Ge recently about her career path and research. What brought you to the field of food safety? I really liked food safety research and the connection it has to public health. I realized my work could affect people's lives and reduce food-related illness in the long run. CPS recently awarded funding for your project "A Sensitive and Specific Molecular Testing Method for Live Salmonella in Produce." What do you think the industry will gain from your research? The industry is intent on finding rapid and accurate ways to pathogens in produce to prevent future outbreaks. There is always a constant search for rapid, sensitive, specific, and cost-effective detection methods to be used by the industry. Where do you see the field of food safety research 10 years down the road? I hope that we are able to apply available technology from multiple disciplines and to gain a better understanding of the interaction between pathogens and food commodities, and to be able to significantly reduce the number of food-related outbreaks. You did your undergraduate work in China; do you have any insights on food safety globally? Food safety is becoming a more prominent concern around the world. In previous years China was more concerned with food quality and less with food safety, primarily due to the fact that traditional Chinese foods are consumed mostly well-cooked. Recently due to the global economy and Westernization in China, China is making strides to improve its food safety together with quality. It shows that food safety is a concern around the world. You started your career in China; what brought you to LSU? I was offered a tenure-track assistant professor position at LSU in 2004 whlie receiving my post-doc training at the University of Maryland. My mentor, Dr. Jianghong Meng, encouraged me to apply and I was fortunate to be offered the position. I still appreciate this opportunity LSU and LSA AgCenter have given me. So would you say Dr. Meng was one of the most influential people in your life? Definitely. I was Dr. Meng's first Ph.D. student and benefited a lot from his close mentoring and exposure to multiple projects, some with FDA scientists. Aside from academic matters, Dr. Meng also taught me to be a more well-rounded and mature person. I spend most of my time as an academic working on publications, funding, and the research itself together with my graduate students, and service to the profession and to LSU. I also teach two courses, "Food Safety" and "Food Laws, Standards, and Regulations." Finally, can you describe one of your career highlights? I would say conducting research that has a positive impact on public health and the scientific community or seeing a graduate student succeed under my mentoring.